Australian table olive production: According to industry estimates there are around 125 table olive producers in Australia with a total grove area of around 900 hectares, producing 4,500 tonne of fruit per annum. Ours is largely a boutique industry, with 80% of table olive producers having less than 5 hectares, and only 4 known producers with more than 40 hectares – by far the largest being Tree Tops Plantation Pty Ltd situated in the NSW Riverina with 125,000 trees producing around 1,000 tonne of table olives per year. Domestic and export market conditions remain challenging for table olive producers with Australian supermarket shelves dominated by cheap imported products. However, the Australian Dollar (A$)  has depreciated against the euro (EUR) from a high of 0.85 in August 2012 to 0.65 in February 2016, which serves to make imports more expensive, exports more competitive, and applying upward pressure on domestic wholesale prices. The quality of Australian table olives is of a high standard, but ours is a small developing industry that primarily supplies the local tourist market, and small retailers. These enterprises will need to be scaled up if they are to achieve the price points and reliability of supply required by the major retail chains. Australian table olive exports  in the 2014-2015 ABS reporting period is 148 tonne (up 12% on the 132 tonne exported in the previous reporting period), with a total value of A$0.94 million. The 17 destination countries listed include: NZ (50%), Spain (18%), UAE (11%), Greece (8%) Japan (3%), Hong Kong (2%), Singapore (2%). The average value of exports was A$6.34 per kg including: NZ ($5.59), Spain ($1.72) UAE ($13.95), Greece ($5.10) Japan ($6.67), Hong Kong ($8.09), Singapore ($11.26). Australian apparent consumption of table olives (domestic production plus imports, minus exports) is estimated at 17,000 tonne or 0.7 kg / person, with imported table olives comprising at least 75% of Australian domestic consumption, highlighting the opportunity for import replacement. The Voluntary Standard for Table Olives in Australia  is the reference standard for the Australian Olive Association (AOA) Code of Practice, and the National Table Olive Competition. The Sixth AOA National Table Olive Competition: Dr Michelle Wirthensohn a Horticulture Australia Research Fellow at The University of Adelaide – School of Agriculture, Food & Wine continues in the role of AOA Head Table Olive Judge. Judging took place at the University of Adelaide Plant Research Centre, Waite Campus on Saturday 29 August 2015, with results announced at the AOA National Conference Awards Dinner held on Monday 14 September on board the PV Mundoo steaming the Murray River at Mildura, Victoria. As a condition of entry, all product must be 100% Australian (i.e. Australian grown olives processed & packaged in Australia) – no issues were reported with these criteria. For the 2015 competition a total of 24 entries from 8 exhibitors were received and assessed, which is well up on the 13 exhibits received the previous year. The breakdown for 2015 was 7 entries in Class 11 – Green Olives, 2 in Class 13 – Black Olives (other than Kalamata), 9 entries in Kalamata, 1 entry in Class 15 (wild olives), 1 entry in Class 16 (dried olives), and 4 entries in Class 18 – (speciality olives), demonstrating once again the popularity of the Kalamata olive. Note: AOA encourages all table olive producers to enter the 2016 competition – details to be advised. Prior to the judging the olives were laboratory tested to ensure they were fit for human consumption and to ensure that the pH levels were within normal parameters (pH max 4.3, salt min 6.0 g/100ml, E coli (below level of detection < 3 cfu*); for the pasteurised products the laboratory also measure Lactobacillus to test effectiveness of pasteurisation (below level of detection < 10 cfu ); pleasingly NO problems were detected with any of the competition exhibits. All 24 exhibits were then judged using a 30 point scale using characteristics such as absence of “off flavours”# and blemishes, appealing colour, good flesh texture, olive flavour, acidity, saltiness and overall flavour balance. A total of 7 bronze, 8 silver and 6 gold medals were awarded across the National Table Olive Competition this year, in comparison with last year’s 5 bronze, 4 silver and 2 gold medals. # absence of “off flavours” – negative attributes  that would render the product unmarketable – abnormal fermentation (putrid, butyric, zapatera), musty, rancid, ‘cooked’, soapy, metallic, earthy, winey-vinegary. Alto Olives (NSW) for Best of Show Table Olives 2015, Best Green Olives (Class 11), and Best Flavoured Olives (Class 18). Talinga Grove (SA) for Best Black Olives (Class 13). The AOA would like to thank the chief steward, the head judge and her fellow judges Bob Barrett, Andrew Markides, Trudie Michels, and Peta Zito for their excellent service to the table olive industry and for ensuring that the 6th National Table Olive Competition was a great success. Note: Full competition results are posted on the AOA website . “Off the shelf” market survey of supermarket table olive products: Since 2014 AOA has purchased commercial table olive products from local supermarkets and included these in laboratory testing and blind tastings as part of table olive competitions. In 2015 there were a total of 19 (5 Australian and 15 imported) commercial green, black and Kalamata table olive products purchased, assessed and compared with the 24 AOA competition exhibits across a range of Classes – Green Olives, Black Olives and Kalamata Olives. Prior to sensory assessment the table olives were laboratory tested to ensure they were fit for human consumption, and to ensure that product physio-chemical and microbiological specifications were within limits of the Voluntary Standard for Table Olives in Australia (RIRDC 2012). One imported (Turkish) brand failed microbiological testing (high Lactobacillus – indicating inadequate pasteurisation), although no product spoilage was evident. The 2015 market survey results are consistent with the 2014 table olive survey findings. The encouraging message for Australian table olive producers and consumers alike is that locally produced table olives are measurably superior to product currently available on supermarket shelves – which are mostly imported from Spain, Greece, Italy, and Turkey. How do I become a Code of Practice Signatory? To encourage table olive producer participation in the Code of Practice, the Code membership fee now covers BOTH evoo and table olive certification. For instance if a Signatory currently produce 8,000 litres of olive oil (annual fee $150) and 4,000kg of table olives (annual fee $50) – they can declare both their evoo and table olive production and pay only the (higher) $150 fee. Other Benefits of Code membership: Code Signatories have access to technical support and training programs as well as receiving generous discounts on entry fees to the AOA National evoo and table olive competitions. 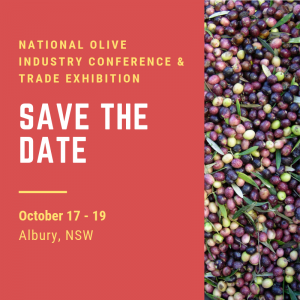 Note: Australian table olive producers who are interested in including table olives in their Code of Practice accreditation should contact the Code Administrator on 0418 839 836 or email peter@mc.com.au . AOA is currently working with River Murray Training (RMT) a Registered Training Organisation (RTO) to develop 6 training modules over a 3 year period, with the aim of building olive industry skills and to facilitate implementation of the Code of Practice. This work is funded from the olive levy R&D through Horticulture Innovation Australia Ltd, Project OL13007: Australian Olive Industry Code of Practice Implementation. All modules are designed to also link to selected national training competency standards that fit within the requirements of FDF30111 Certificate III in Food Processing. Eight olive industry ‘enterprise trainers’ have been recruited and are currently undertaking training with RMT to build industry capacity to deliver Code of Practice modules to olive producers in the regions. To date the project has developed and trialled Modules 1 and 2 these includes 4 ‘on-line’ interactive presentations with workbooks that aim to train olive producers comply with CoP requirement to adapt and implement a food safety and food quality plan for their individual enterprises. Modules 3 and 4 are under development and aim to train olive producers to participate in “The Olive Route” export program to China. Industry participants who complete this training, and related export Code of Practice compliance activities will meet the requirements for participation in ‘The Olive Route’ China export initiative. Modules 5 and 6 are currently under development and aim to train and accredit olive industry participants in quality and style assessment of olive oil and table olives. This will provide a solid foundation for the proposed nationally accredited sensory training for olive oil and table olive competition judges for which AOA is currently developing a policy. Establishing Protocols and Guidelines for Table Olives processing in Australia’ (RIRDC 2004) , and a companion publication – Producing Table Olives (Landlinks Press 2007) , by Professor Stan Kailis and David Harris provides Australian olive growers and processors with internationally based guidelines for ensuring the quality and safety of processed table olives. A simple “how to” guide to processing various styles of table olives by Professor Stan Kailis can be found on the AOA website . This import / export report was prepared by Wayne Prowse | Principal & Senior Analyst | Fresh Intelligence Consulting. Ref: Section 5.1 IOC Method Sensory Analysis of Table Olives COI/OT/MO No 1/Rev.2, November 2011.